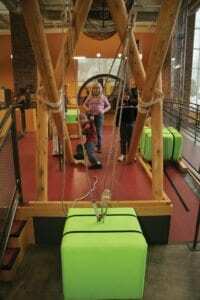 Discovery Center of Springfield is an interactive, hands-on science museum committed to inspiring people of all ages with a life-long love of learning and an appreciation for the world and our place in it. DCS promotes Great Minds @ Play by creating and maintaining a fun, inspiring, and interactive educational resource center for students, teachers, and families of the Ozarks. DCS demonstrates science, technology, art, history, and culture through exhibits, programs, and collaborative efforts. DCS provides a number of unique, educational opportunities that provide hands-on, interactive, inquiry based learning experiences to help increase participants’ deductive reasoning and critical thinking skills. DCS delivers science lessons aligned to Grade Level Expectations (GLE). Activities used to improve science knowledge include taking ScienceWorks and On The Road outreach programs to classrooms and youth organizations throughout southwest Missouri. 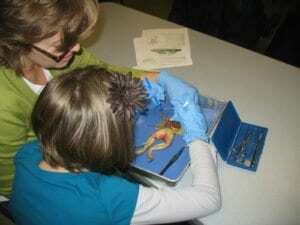 Hands-on labs with a science specialist are delivered through DCS programs. Field trips and general public experiences enable children and adults to experience a unique learning environment of science and cultural exploration with hands-on, interactive exhibits onsite. DCS Science Sprouts programs address the critical needs of ensuring children are starting Kindergarten ready to learn. After-school programs such as Discovery Science Club target inner city public middle school students who are at-risk, low achieving students. The program focuses on inquiry based activities relevant to their lives. Students have fun learning and for the first time ar engaged in what they are learning and motivated to stay in school. Additional special educational events include Earth Day, cultural days, Pi Day, DNA Day, Nano Day, scout nights, and camp-ins to assist in earning badges. 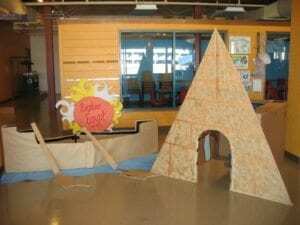 The Discovery Center hosts traveling exhibits and has recently implemented Scientist Saturdays. Scientists Saturdays feature local and regional scientists and researchers from the public, private, and university sectors who have completed our Science Communication Fellowship Program. These fellows now interact with visitors to communicate their research or product through activities; this brings real science to the forefront of the visitor experience. 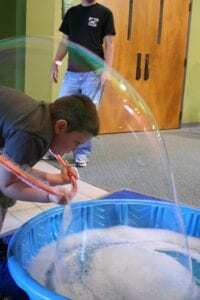 Discovery Center of Springfield is not only a great place to visit with friends and family of all ages, but we also serve as southwest Missouri’s primary science education resource facility. We currently serve 30 counties in Missouri, 33 other states, and 3 other countries including Mexico, Canada, and Australia through our general admission, field trips, home school, outreach programs, summer workshops and in-house programming.